On 8 March we celebrated International Women’s Day. Marches were held around the world to rally for equality and celebrate womanhood. Melbourne’s CBD was filled with women from all walks of life wearing purple and proudly holding signs demanding justice. Last week it was the students’ turn. 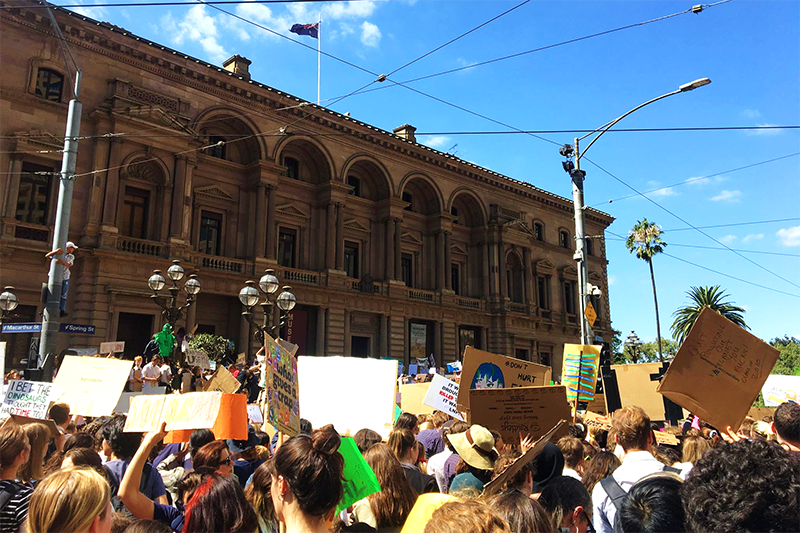 Striking from school, more than 100,000 kids took to the streets on Friday 15 March, as part of over 50 planned rallies across Australia to protest systemic failures to address climate change. Both events amassed large numbers of people. Both events sought societal and political transformation. But how effective are such rallies? There’s no denying the inherit power in the assembly of large groups of people united by a common cause. However, these recent rallies sparked in me questions about the efficacy and purpose of protests. Do they enact substantial change, or are they more of a means of empowerment and solidarity? Historically, protests and marches – such as the 1913 Woman’s Suffrage parade or Martin Luther King’s march on Washington in 1963 – have been viewed as instrumental in making changes to laws and society. But in each of these cases, was it the protest itself that actually led to change, or was it the wider social movement? I would be hesitant to suggest that one march, one speech or one peaceful demonstration can directly incite change. Instead, I believe that rallying and protesting serve to represent broader revolutions. Whilst the rallies themselves don’t force change, they are an indication of societal dissatisfaction with the status quo, and they inspire others to also act. Moreover, the coming together of people who share a desire for change is empowering and can provide a sense of solidarity to those feeling discontent with or marginalised by their government or society. When all seems bleak, rallying together can provide a sense of hope. As an intern at Currie, I’ve become more conscious of the latest news in the agriculture and sustainability sectors – and the outlook is often grim. From devastating droughts, bushfires and flooding across our nation, to international reports revealing that even adhering to the Paris Agreement goals won’t stop the inevitable warming of the Arctic, there seems to be no end of disasters facing our environment. But on Friday I visited the Melbourne Climate Strike and couldn’t help but feel inspired. There were thousands of students gathered there from hundreds of schools around Melbourne. Melbourne was just one of 1,769 places in 112 countries where students marched over climate inaction. Despite our federal government’s failure to act on climate issues, these young people – the leaders, innovators, lawmakers, inventors, politicians and scientists of the future – feel passionately enough about this cause to take action. And there is immense power in that. So even if these protests in and of themselves don’t end up changing the world, they still play a crucial role in the broader movements that result in a better world for us all. And that’s something worth marching for. Izzy is the latest addition to the Currie team, interning with us until the end of May. Studying politics and media communications at Melbourne University, Izzy was drawn to Currie for our focus on sustainability.